& Development”, in commemoration of The World Interfaith Harmony Week. terrorist extremism and violence all over the world. respect of diversity and his engagement against terrorism. 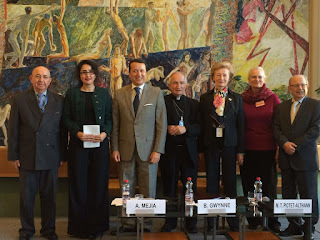 fraternity, and interreligious dialogue as the main condition to attain peace. life and human dignity in order to create dialogue between all people. which may sometimes lead to violence and terrorism. economic development and to create dialogue for peace. that is imperative in fighting threats of terrorism against other religions.